The final scene of Star Wars Episode VII: The Force Awakens, takes place “A long time ago, in a galaxy far, far away.” The actual set for that final moment is a stony island off the west coast of Ireland called Skellig Michael. In that finale to the movie, Rey (Daisy Ridley) locates the missing Luke Skywalker (Mark Hamill) and returns his lightsaber. Skellig Michael is the site of a Christian monastery that was occupied from sometime around the sixth century up to the twelfth. Stone built structures, including “beehive huts” and a small church are located on the steep slopes of the island. 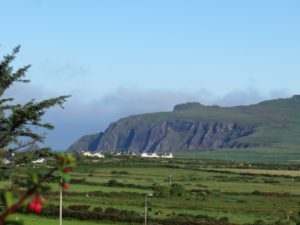 But when it came time to film the next movie in the series, the producers reproduced the Skellig Michael set just up the coast near the village of Ballyferriter. 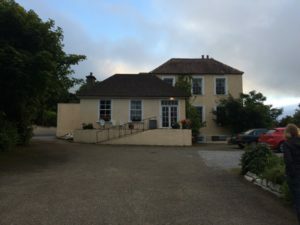 Laurie, our friend Mary, and myself spent two nights in a nineteenth century rectory that boasts a distant view of the film location. We arrived a few weeks after filming in this historic Dingle Peninsula town had wrapped. 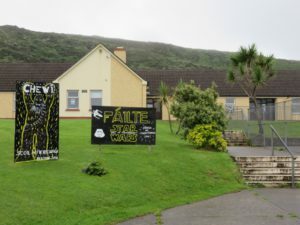 The people of Ballyferriter (Baile an Fheirtéaraigh in Gaelic) took great pride in their village’s role as “The Home of Star Wars.” Gaelic signs throughout the town celebrated the fact. 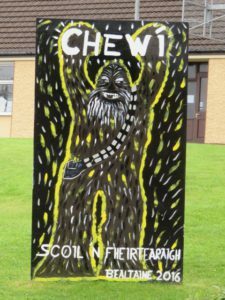 Chewbacca even made a visit to the local primary school–where he didn’t tear off anyone’s arm. The Dingle Peninsula, where Ballyferriter is located, is the westernmost point of Europe. The people of this county like to say that the next parish over is Boston. 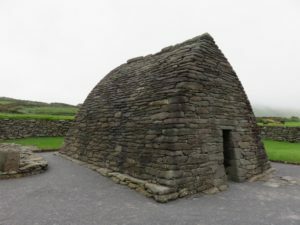 According to local sources the production company took five months to build the “Skellig Michael” set on the cliffs overlooking the North Atlantic. The beehive huts are fiberglass instead of stone and in some cases are raised for improved camera angles. They scheduled a week and a half for filming but because of unseasonably excellent weather, only needed four days. In fact the crew had been given Sunday off but were called back because of clear conditions. One local told us that the sun set that night was so brilliant that some thought that the film crew had created some kind of special effect. I can’t wait to see it in the theaters. Another area resident told us that every person on the set had to submit their phones for inspection each morning to security. A special piece of tape was put over the camera lens to prevent unauthorized videos and pictures. When they left each evening the tape was inspected. If the color had changed, it was an indication of tampering and the phone was confiscated. Evidently the tight security and confidentiality agreements didn’t prevent pictures and videos from leaking. Some security personnel even lost their jobs—because they were selling forbidden images. Alas, we arrived two weeks after filming had wrapped and all evidence of the set had been erased. We hiked through the fog one morning from the golf course toward the set on farm roads. The gates to the location site were closed up. 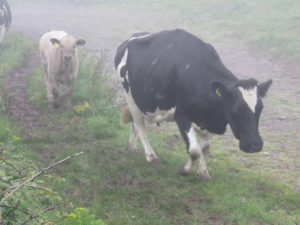 At one point a herd of cows, unsupervised by either human or canine caretakers, came up the dirt path we were on toward a field beyond. They were reluctant to pass until we climbed up on a wall to let them through. When I asked them what they had seen of the filming they were silent—not even a moo. Evidently they had signed confidentiality agreements and took them more seriously than their human counterparts. An adolescent bull stopped and eyed us—close enough that I could have leaned over and tugged on the brass ring in his nose—but passed on by with the rest of the bovines. Ballyferriter itself is an interesting place. Seventy five percent of the residents speak Gaelic as their native tongue. Signs, instead of being in Gaelic and English as in most parts of Ireland, or Gaelic only. I dropped into a local market and the clerk was carrying on a conversation with a customer in the traditional Irish language. And the signs and brochures at the local church were primarily in Gaelic. Like most of the people we’ve met in Ireland the residents were friendly, quick to kid around, and helpful. The big difference in this area is that talk of the weather has been supplanted by stories about the Star Wars production. Star Wars Episode VIII is scheduled for release December 15, 2017. 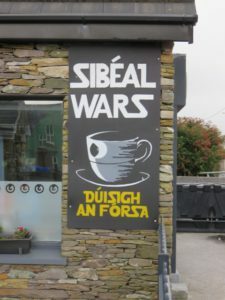 I’m looking forward to seeing the Gaelic influence on the next movie in the franchise. And remember that Luke and Rey aren’t really in a galaxy far, far away. They’re just toward the end of the Dingle Peninsula.